Cancel all your plans and take a ticket if you can or arrange your house for this exciting football match in Barcelona city. 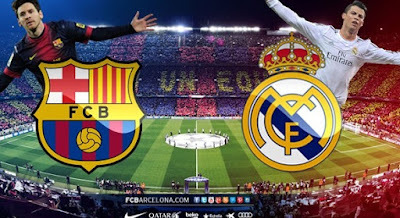 This great match will be played at Camp Nou in Barcelona city between FC Barcelona and Real Madrid. Fans are looking forward to watch this big meeting at Camp Nou. The match will be played on 3 December 2016, Saturday. El Clasico will start at 6.15 pm. Catalans want to catch up with 6-point difference to 3. Jeremy Mathieu can't play at this match due to his health problems and Jordi Alba will decide at the match time whether he will play or not. In Real Madrid's part, Gareth Bale, Alvaro Morata, Toni Kroos and Coentrao have health problems also. This big match will be displayed in 185 countries. Don't miss FC Barcelona Real Madrid El Classico match if you are in Barcelona city. El Classico Real Madrid Elevens are Navas, Carvajal, Varane, Ramos, Marcelo, Modric, Kovacic, Vazquez, Isco, Ronaldo, Benzema. El Classico FC Barcelona Elevens are Stegen, Roberto, Mascherano, Pique, Alba, Rakitic, Busquets, Suarez, Neymar, Messi, Luis Suarez. For more Barcelona 2017 events please check your Barcelona Travel guide. Sport events in Barcelona city will take place at our site continually.